The species Schizostylis has bright red, bowl shaped flowers that look as if they belong in a midsummer border. This form has smaller flowers with narrow petals that create a star-like effect and feel much more at home in the waning weeks of the year. It can be a temperamental plant, particularly in dry soils. To thrive it needs far more moisture than its South African origins might suggest, so mulch regularly with moisture-retaining compost. In mild winters a few tenacious flowers will hang on through December, and one year we even had flowers at Christmas. 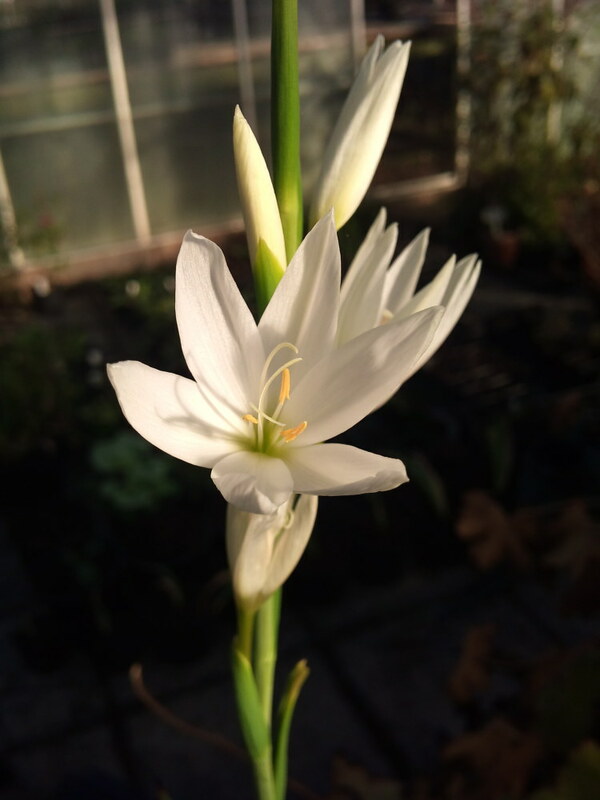 As long ago as 1996 botanists decided that Schizostylis were not a distinct genus and that they should be part of Hesperantha. A lot of nurseries are now moving over to the new name. I’ve always known them as Schizostylis and, although it has taken years of practice, I can even spell the word without stopping to think so I will continue calling them Schizostylis. Yes, sure I’ll change eventually, but not quite yet. The plant was also know for decades by a name which is now considered a racial slur in South Africa. The word has little meaning for northern Europeans like myself but I’ve stopped using it. Every South African I have ever met, from all races, have been so friendly and welcoming that I wouldn’t want to upset a single one of them.